We tried Serbian fish from Supercook. Haddock fillets are marinated in white wine, onion, garlic, fennel seeds, lemon juice and parsley. Meanwhile potato slices are baked in the oven with tomatoes, salt, paprika and flour. The marinated fish is then added to the baking dish together with chopped bacon, mushrooms and sour cream and returned to the oven. 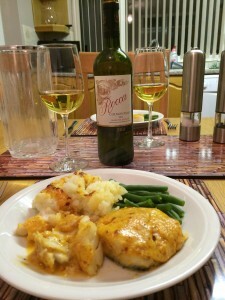 A tasty way to cook haddock. 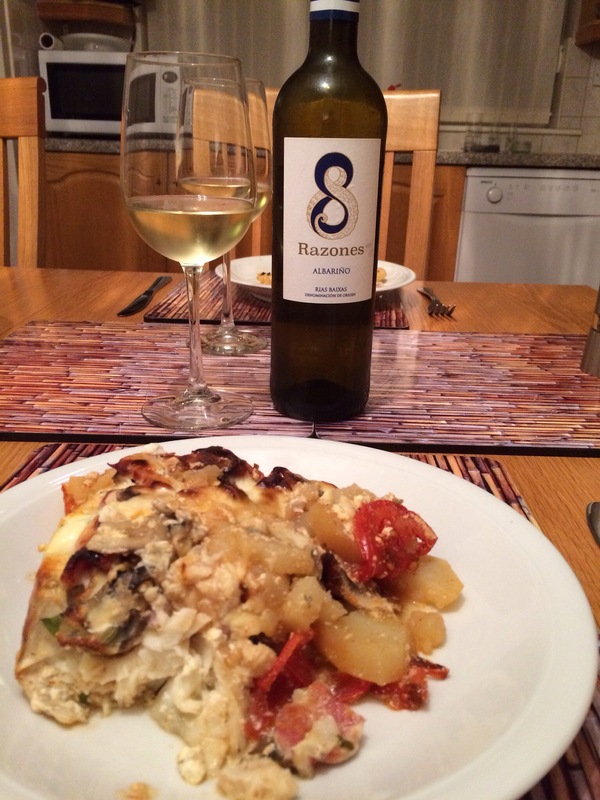 To drink with the fish we chose a bottle of 8 Razones Albariño 2013, a Spanish white from Sunday Times Wine Club. There was a slight sweetness with citrussy, yet mellow nectarine flavours. The wine paired well with the meal. We pan-fried whole plaice and served the fish with Sauce Normande, sauté potatoes and green beans. We used the Supercook recipe for the sauce. It’s made from butter, flour, fish stock, mushroom ketchup, egg yolks and single cream. We opened a bottle of Sendero des Santos Albarino 2012, a Spanish white from Sunday Times Wine Club. See here for another pairing with this superb wine. There were tropical fruits on the nose followed by flavours of pineapples and peaches with a lemony finish. A delicious tangy mouthful and very good with the plaice. We tried Grilled Salmon with Dill and Lemon from bbq.about.com The salmon is marinated in lemon juice, lemon zest, garlic, oil and dill and then barbecued. 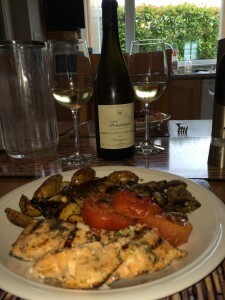 We served the salmon with baked potato wedges, mushrooms and tomatoes. To go with the salmon we decided on a bottle of Touraine Sauvignon Blanc “Les Hauts Lieux”, Bougrier 2013, a French white from the Wine Society. We thought the nose was slightly grassy and the taste was fresh and lemony with some tropical fruits. The finish was crisp. A good match with the barbecued salmon. For a midweek meal we tried Fish Grilled with Cheese from Supercook. Cod loin pieces are grilled and then topped with a mixture of onion, cheddar cheese, English mustard, tomato ketchup, salt, pepper and cayenne pepper. The fish is then put back under the grill until the mixture is bubbling and brown. We thought the topping had a nice savoury and spicy kick to it. 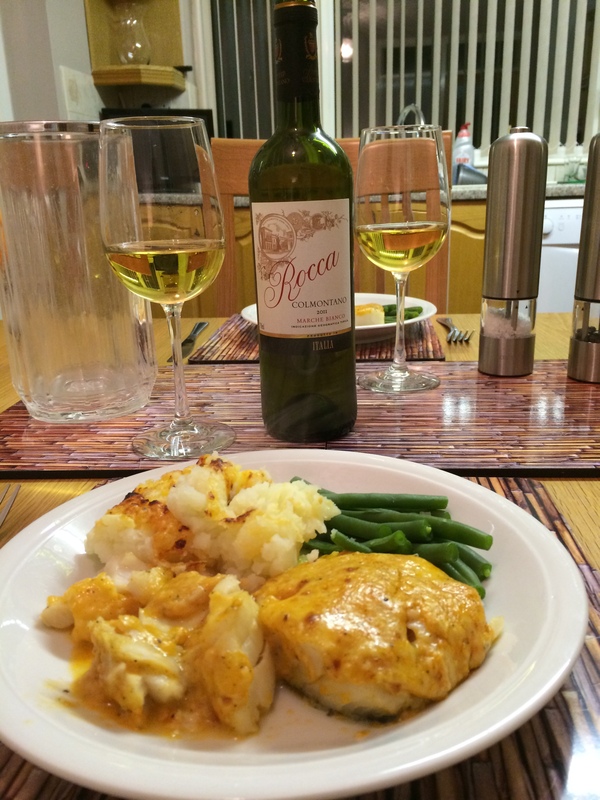 We opened a bottle of Rocca Colmontano 2011, an Italian white from Sunday Times Wine Club. The wine is a blend of Trebbiano with a little Verdicchio. The first thing we noticed was the deep gold colour of the wine in the glass. We tasted slightly sweet honey and then tropical fruits, especially pineapple. There was creaminess on the finish. We thought the wine’s affinity with the food improved as the meal progressed. A good match. We cooked Smoked Haddock Baked with Mushrooms from Supercook. The smoked haddock fillets are poached with mushrooms, Béchamel sauce, double cream, Emmenthal cheese, nutmeg and cayenne pepper. 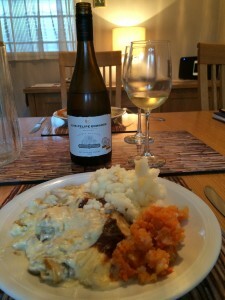 We served the fish with mashed potatoes and carrot and swede mash. To accompany the meal we chose a bottle of Luis Felipe Edwards Sauvignon Blanc Gran Reserva Leyda Valley 2012, a Chilean white from Tesco. We tasted zesty grapefruits, an earthy minerality and a clean spicy finish, which had some affinity with the spice from the cayenne pepper. A very good match with the fish. 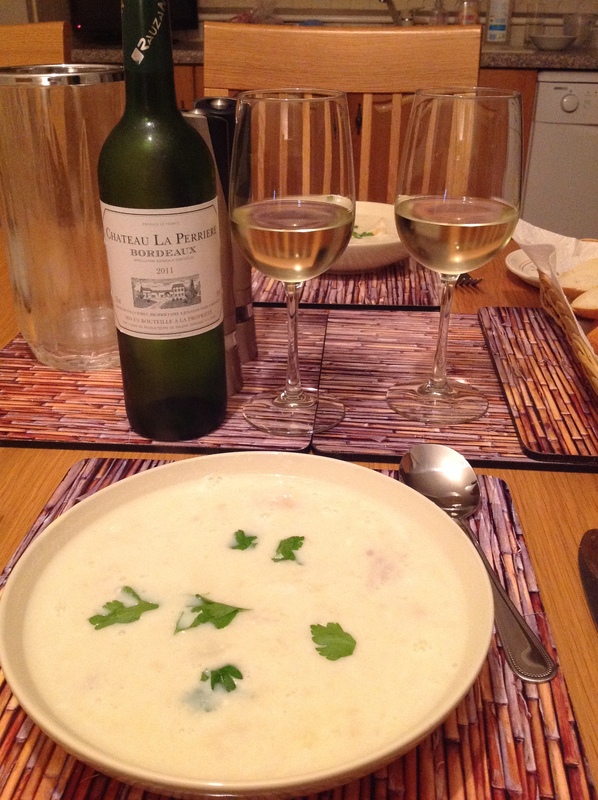 We tried Cullen Skink from Supercook. This is an old Scottish recipe, which is a mixture of a soup and a stew. The basis of this dish is smoked haddock that orginated in the fishing port of Findon or Finan on the northeast coast of Scotland. The smoked haddock is served in a liquid containing onions, seasoning, potatoes and milk. A warming meal for a winter’s day and lovely with some crusty bread. 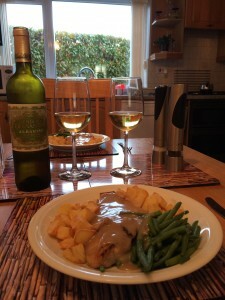 To drink with the meal we opened a bottle of Château La Perrière, Bordeaux 2011 from the Wine Society. We last drank this Sauvignon/Semillon blend with a chicken pie. We thought the wine was fresh, clean, crisp with lemony acidity and a nice tangy citrus finish. A good match with the Cullen Skink. We tried the fish pie recipe from Jamie Oliver’s website. The pie contains salmon, smoked haddock and prawns and has a lovely lemony flavour, with a spicy kick from the addition of red chilli. We served it with runner beans. We thought a lemony white would be just the job to drink with the meal and opened a bottle of Albarrada Vinho Regional Alentejano 2011, a Portuguese white from the Sunday Times Wine Club. We detected freshly cut grass on the nose, clean, fresh lemon fruitiness and a little earthiness, with a creamy finish. We thought this was a very good match. We have some fishing lakes near us called Jacklands where we can buy freshly-caught trout that are ideal for a barbecue on a warm day. We found an ideal recipe on the British Trout Association website – BBQ Lemon and Herb Trout. The trout are stuffed with lemons, parsley, thyme, garlic and rosemary and served with potato parcels that are also cooked on the barbie. 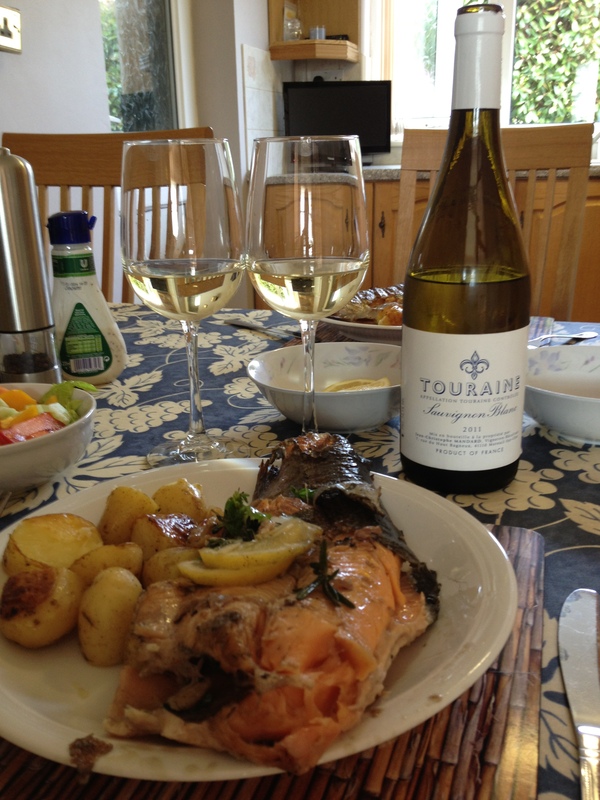 To drink with the meal we opened a bottle of Touraine Sauvignon Blanc, Mandard 2011, a French white from the Wine Society. It appeared golden in the glass and tasted fresh with citrus lemon flavours and a clean, creamy tropical fruit finish. A really good wine and a very goo d match with the fish. 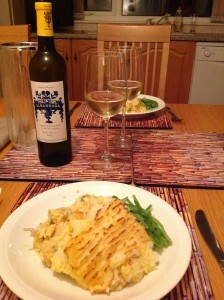 We found this interesting recipe on the Guardian website – the Perfect Fish Pie. It includes fish stock, white wine, parsley, white fish or salmon, smoked white fish, prawns, anchovies and double cream. A very tasty recipe and highly recommended. Could we achieve the perfect wine match with it though? We opened a bottle of Doña Paulina Chardonnay 2012, a Chilean white from the Wine Society . we tasted melon, citrus, tropical fruits and it had a beautiful creaminess that complemented the food. 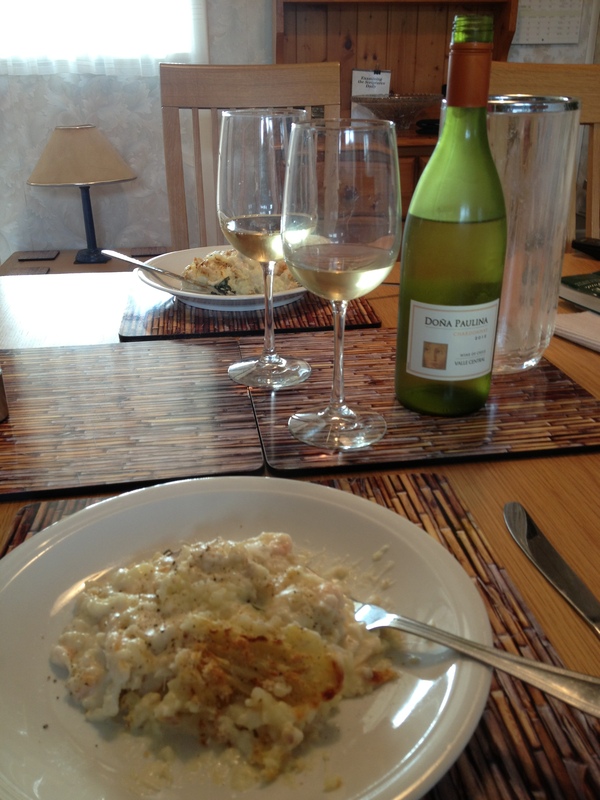 The wine was indeed the perfect match for the “perfect fish pie”. 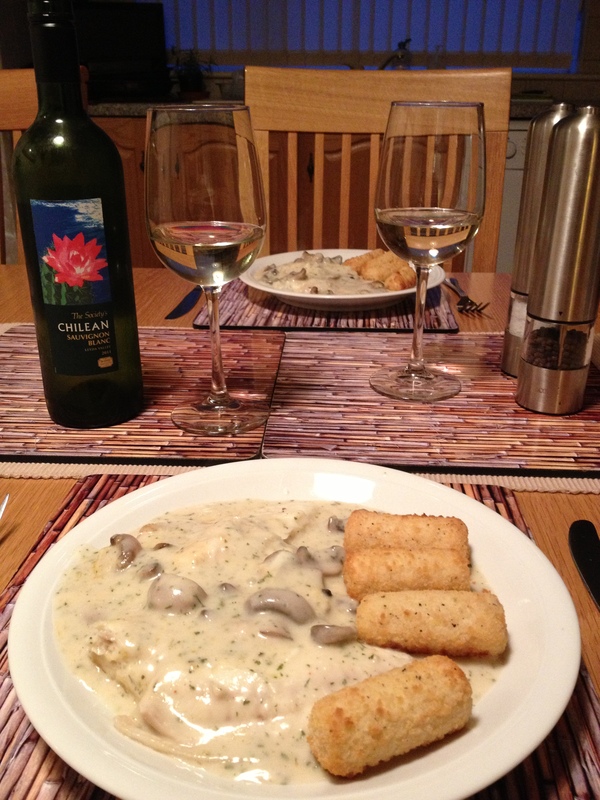 We cooked one of our favourite fish recipes – Plaice Baked with Mushrooms, from Supercook. As well as mushrooms, the fish is baked with cream, lemon juice, white wine, black peppercorns, chervil, cayenne pepper and is topped with melted cheddar cheese. As recommended, we served it with croquette potatoes. Delicious. We accompanied the meal with a bottle of the Society’s Chilean Sauvignon Blanc 2011, from the Wine Society. 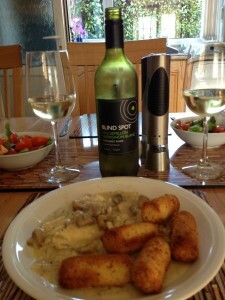 This white was crisp, intensely fruity, with hints of pineapple and was a good match with the plaice. We cooked this dish again a few months later, but this time we tried a bottle of Blind Spot Semillon Sauvignon Blanc 2012, an Australian white, also from the Wine Society. We found this crisp, lemony with hints of apple and minerality. The wine had an affinity with the lemon in the sauce. Another good match.